Fighting Childhood Homelessness Through Millennial Impact. Learn what motivates twenty-something donors to engage with a nonprofit and cultivate that through a cause-driven campaign that members want to get behind. LINC (Lead. Impact. Network. Change.) is a United Way of Greater Atlanta group for donors ages 22-30, with a focus on personal development and volunteerism. Our approach began by helping United Way of Greater Atlanta develop a clear understanding of the organizational objectives for its new Millennial group, researching the target audience and discovering what drives that audience to engage and donate. From our findings, we developed Give 5 Change Lives. 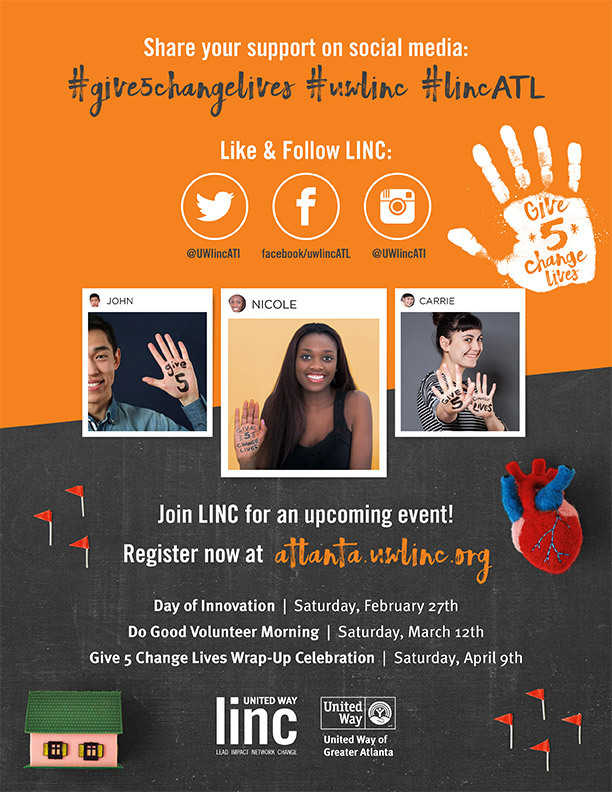 This all-encompassing, 3-month campaign encouraged LINC members to “take 5 minutes, give $5 and tell 5 people” about the issue of childhood homelessness, with the goal of raising money to benefit homeless students in Greater Atlanta. Give 5 Change Lives, LINC’s first ever campaign for a cause, raised $3k for United Way’s Kids Home Initiative – a program for homeless students and their families in Greater Atlanta. The campaign also helped fund an achievement club for 21 high school students, drove LINC volunteer hours and contributed to the $400k raised by LINC donors that year. We’re also proud that the Give 5 Change Lives campaign earned us a 2017 International Communicator Award of Excellence in the Integrated Campaign, Cause Marketing Category.